Esco Tool has introduced an O.D. 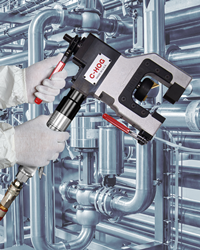 clamping portable beveling tool that is ideal for performing end preps on thin-wall tube where maintaining the integrity of the inside diameter is critical. This robust tool can produce any angle of prep and is capable of prepping and flat-facing simultaneously. Capable of prepping and flat-facing simultaneously, the C-HOG MILLHOG® O.D. Clamping End Prep Tool is suited for tube and pipe from 0.50” I.D. to 3.0” O.D. The C-HOG MILLHOG® O.D. Clamping End Prep Tool evenly distributes holding power to securely mount on the outside of high purity thin-wall tube and perform chatter-free welding end preps. Esco Tool has introduced an O.D. clamping portable beveling tool that is ideal for performing end preps on thin-wall tube where maintaining the integrity of the inside diameter is critical. The C-HOG MILLHOG® O.D. Clamping End Prep Tool evenly distributes holding power to securely mount on the outside of high purity thin-wall tube and perform chatter-free welding end preps. Maintaining the integrity of the inside of the tube, it can produce any angle of prep including j-preps without needing cutting fluids and is ideal for orbital welding. Capable of prepping and flat-facing simultaneously, the C-HOG MILLHOG® O.D. Clamping End Prep Tool is suited for tube and pipe from 0.50” I.D. to 3.0” O.D. and is offered with pneumatic, electric, and battery power. Equipped with a ratchet feed, it provides over 1” of stroke for smooth operation. The C-HOG MILLHOG® O.D. Clamping End Prep Tool sells for $4,695.00 and is available for rent in the continental U.S.A. for $250.00 per week.